Today, June 27th, marks the 40th birthday of the device that has a large impact on the world: the ATM. 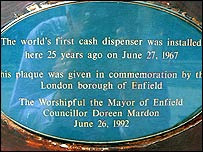 The Inventor of the cash machine (ATM), John Shepherd-Barron, installed the first automated teller machine, known then as cash machine in Enfield, North England in a Barclays branch. The cash machine installed used a check authenticated by a four digit PIN, also another invention. Why four digit when now the industry is moving into 6 digit to improve security? Because John's wife said she can only remember a four digit PIN. I downloaded and installed the newly-released Safari on Windows (available here in order to see for myself how Apple's venerable browser looks and feels like on my notebook. After opening a few tabs of a news site, Safari crashed and generated Application logs I appended below. Now, that's normal behavior for a product still i beta stage. Unlike the vaunted Windows Vista that I found too slow on my brother's new Toshiba Satellite notebook running on Intel Core 2 Duo. Faulting application safari.exe, version 3.522.11.3, faulting module ntdll.dll, version 5.1.2600.2180, fault address 0x0003426d.